Zeus Din family products were born with the idea to combine the ease of installation and ease of use with the professional needs of an installer of electrical installations. Being able to monitor the energy profile of an electrical user, evaluate the leakage current of an electric system, verify the quality of the line voltage, are fundamental information to intervene in a timely and decisive at a customer that has issues related to the electrical system. The management of the historical records, thanks to the internal memory in devices, allows for long-term assessments without expensive measurement campaigns. The Zeus Din family products, having an Ethernet interface and a Web server on board for configuration and monitoring, are designed for IoT technologies. The Easy Connect feature allows all family devices to be plug & play. Simply connecting the Ethernet interface to an existing network, the device will be accessible from anywhere in the world without any network configuration, using any smart device (PC,tablet or smartphone) and a web browser. Zeus Din is a network analyzer for single-phase electrical system with logging capabilities of the monitored quantities. 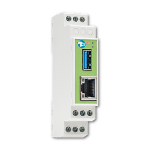 Zeus Din PV is a network analyzer for single phase electrical system connected to a photovoltaic system, which integrates the logging capabilities of the monitored variables. 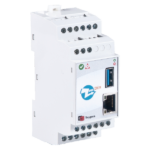 Zeus Din 3 is a network analyzer for three-phase electrical system with logging capabilities of the monitored quantities.